Students’ perceptions of acceptance is the third determiner of how they feel about themselves and the classroom environment. A number of classroom activities have the potential to capture and hold students’ attention. Effective questioning strategies can trigger situational interest and help foster maintained situational interest. When given choice by teachers, students perceive classroom activities as more important. Providing students academic choices increases engagement. Teachers can build choice into the process of designing standards for expected classroom behaviors. The most general influence on a student’s emotional engagement is a teacher’s positive demeanor. To foster student engagement, classroom instruction decisions are based on four emblematic questions. Pacing is a basic teaching tool, but often an overlooked aspect of keeping students' energy levels high. Wait time is one effective way to increase student response rate. The use of positive information can help grow communication with students. Motivation can create a hierarchy of goals. Movement can be used to lift energy by associating it with rehearsal. Teacher-student relationships are key to ensuring that students feel good about being in class, and can respond positively to the question, "How do I feel?" One simple way to invite simultaneous individual response is to use hand signals. Teachers can use stories from literature and history as examples of people whose lives have demonstrated the power of self-efficacy. Stated differently, if students sense that they are not welcome, accepted, or supported in the classroom, it is unlikely that they will engage in classroom activities. Certainly, the relationship teachers have with students is one of the most powerful determiners of how a student answers the question “How do I feel?” Carol Goodenow (1993) found teacher support was consistently the strongest predictor of motivation among students in sixth through eighth grades (p. 6). Game like activities help trigger situational interest and provide a foundation for maintained situational interest because they tap into the psychological principle of clozentropy (see Broadhurst & Darnell, 1965; Darnell, 1970, 1972; Taylor, 1953; Weiner, 1967). Basically, the theory of clozentropy states that the human mind will naturally attend to situations that have missing details. Hermann Ebbinghaus (1987) addressed this point, noting that human beings tend to fill in the blanks when presented with incomplete information. (p. 9). Specifically, it makes intuitive sense that when a student is answering a question, his or her working memory is fully attentive to the task at hand. Students’ attention to questions is most likely due to the fact that a question, by definition, presents missing information. To this extent, questions are like games. Indeed, many games rely on questions. In the context of the classroom, questions can generate mild pressure that helps stimulate attention (pp. 11–12). Research has shown that providing choices to students of all age levels often increases their intrinsic motivation. Choice in the classroom has also been linked to increases in student effort, task performance, and subsequent learning. However, to reap these benefits, a teacher should create choices that are robust enough for students to feel that their decision has an impact on their learning. In order to incorporate choice into the classroom, we recommend teachers provide choice to students in four ways: (1) choice of tasks, (2) choice of reporting formats, (3) choice of learning goals, and (4) choice of behaviors (pp. 14, 101). Choices of task, reporting format, or learning goal allow students to take control of their learning and make decisions that ensure personal interest in their assignments. To provide a choice of task to students, a teacher can provide multiple task options on an assessment and ask students to respond to the one that interests them most. Similarly, a teacher can provide students with the option to choose their own reporting format. The two most common reporting formats are written and oral reports, as they can be used with most subjects. However, students may also choose to present information through debates, video reports, demonstrations, or dramatic presentations. To give students a particularly powerful choice, a teacher can ask students to create their own learning goals. When giving students the option to design their own learning goals, a teacher should hold students accountable for both their self-identified learning goal as well as teacher-identified learning goals for that unit (pp. 101–104). Creating a classroom constitution at the beginning of the school year can provide students a chance to determine how the classroom functions as a unit. To infuse choice into this process, a teacher can ask small groups of students to describe their ideal classroom environments and isolate desirable and undesirable behaviors and attitudes. Groups can then give presentations on their lists of ideal behaviors and attitudes. Afterward, the class can come together and articulate specific behaviors and attitudes into concrete principles, eventually compromising as a class to decide which principles to incorporate into a set of classroom behavior standards. By following this process, individual students gain voices within the classroom and are less likely to feel that arbitrary rules are being imposed on them (pp. 104–105). A teacher can communicate a positive demeanor through demonstrating enthusiasm and intensity, both of which have been associated with student engagement and achievement. Clearly, relationships students have with the teacher have a profound effect on their perceptions of being welcomed, accepted, and supported, which helps establish an affective tone that promotes student encouragement (pp. 5–7). The first two questions focus on the attention of the student, while the last two questions gauge the engagement of the students’ interest in the topic. The attention questions deal with whether information from the outside world gets into working memory. If the information presented is not considered interesting, the working memory will not process it. Engagement is defined by importance; if the information is not deemed important, the working memory will not maintain it for long. If students do not believe they can perform the tasks, the brain will eventually reject it (pp. 8–19). Pacing is a basic teaching tool, but often an overlooked aspect of keeping students’ energy levels high. If pacing is too slow, energy in the classroom drops and attention wanes; however, if the pacing is too fast, students can be confused and frustrated. To help achieve a balance, focus on pacing when handling administrative tasks, transitions, assigning seatwork, and presenting new content (p. 21). Waiting to call on students allows them to process the question and encourages them to think through their answers instead of impulsively responding. A teacher can use less wait time after asking a straightforward question with one correct response and more wait time after asking a complex or open-ended question that requires interpretation (p. 71). One simple way to communicate respect and acceptance is to find something positive about students and then use that information to both plan instruction that addresses students' interest and communicates concern for specific students. This is particularly true for students who may have discipline issues or who appear alienated from the rest of the class or teacher (p. 40). Students are always behaving in such a way as to accomplish one goal or another. For example, at the basic level, students (as well as everyone else) are always working to ensure that basic subsistence goals such as safety, food, and shelter are being met. Perhaps at the highest level are goals that address life ambitions. These goals typically deal with accomplishments that people perceive as defining their future lives. 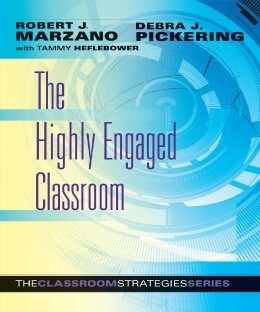 Fundamentally, classroom activities that make connections to the real world will help generate a positive response (p. 87). Rehearsal refers to repeating important information in a way that helps students remember it. For example, a teacher who has noticed his or her students are having difficulty recalling units of measurement might ask them to represent the largest of the units by standing straight up, the smaller measurements by bending over, and the smallest measurements by kneeling down (p. 25). Teacher-student relationships are key to ensuring that students feel good about being in class and can respond positively to the question, "How do I feel?" One of the most interesting aspects of powerful teacher-student relationships is that they are forged by behavior and words as opposed to thoughts and feelings. Stated differently, it is not what a teacher thinks and feels about a particular student that forges a positive relationship with the student. Rather, it is how the teacher speaks to and behaves with the student that communicates respect and acceptance (p. 36). It is important to note that when hand signals are used, questions must employ a selected-response format, such as multiple choice or true/false. If four responses are provided in a multiple-choice item, students can signal the correct answer by holding up one finger for the first option, two for the second option, and so on. Using simultaneous individual response is one way to increase engagement and help them respond positively to the question, "Am I interested?" (p. 74). Self-efficacy is quite possibly the most important factor affecting engagement. Even if students feel good, are interested in what is occurring, and believe it to be important, they will probably not fully engage if they believe the task is impossible. Clips from movies such as Rudy, Oliver Twist, and Apollo 13 can be used to helps students discern common traits among those who accomplish great things even in the face of significant obstacles (pp. 117, 128–129).